This ticket allows entry on 4/27 and 4/28. The event is from 3PM until midnight Saturday and Sunday. Your wristband(s) will be delivered via USPS First-Class Mail. Orders can only be shipped within the United States. If you do not receive your wristbands within a week of the event, please contact us at help@seetickets.us. All orders purchased prior to Thursday, April 11 will be eligible to have wristbands shipped. All orders placed after this date must be redeemed at the will call station at the event. Service fee includes $16 Tax. - Access to private cash bars. The event is from 3PM until midnight Saturday and Sunday. All orders purchased prior to Thursday, April 12 will be eligible to have wristbands shipped. All orders placed after this date must be redeemed at the will call station at the event. Service fee includes $21.76 Tax. This ticket allows entry on 4/27. The event is from 3PM until midnight Saturday and Sunday. Service fee includes $9 Tax. This ticket allows entry on 4/28. The event is from 3PM until midnight Saturday and Sunday. Service fee includes $11.96 Tax. Reserve your personal locker for both days now! Yours for the duration of the fest’ enjoy unlimited access, as you hit the dance floor all day and night. Measuring approximately 8″ high x 11″ wide x 17″ deep, a personal locker allows you to safely stash your belongings. Reserve your personal locker with charging cable now! Yours for the duration of the fest; enjoy unlimited access as you hit the dance floor all day and night. Measuring approximately 8″ high x 11″ wide x 17″ deep, a personal locker allows you to safely stash your belongings. Stow away your things and plug in your phone to keep the battery charged. In order to claim your locker, bring your Locker ticket and photo ID to the Locker tent on the festival grounds! Staying hydrated is a must to keep the party going! This aluminum reusable water bottle features the iconic Disco Donnie logo. Perfect for refilling at the festival's free water stations. To claim your bottle, please visit the Merchandise booth with a copy of your water bottle ticket and/or photo ID! Secure your own personal Ubbi with these collectible figurines! All figurines will be picked up at the main merch booth inside the festival, NO ITEMS WILL BE SHIPPED. Secure your own personal Dubbi with these collectible figurines! All figurines will be picked up at the main merch booth inside the festival, NO ITEMS WILL BE SHIPPED. 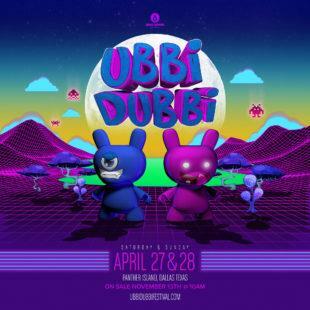 Secure your own personal Ubbi & Dubbi with these collectible figurines! All figurines will be picked up at the main merch booth inside the festival, NO ITEMS WILL BE SHIPPED.